Any time that I can get my girls up and moving around while they're learning, that's a great thing! 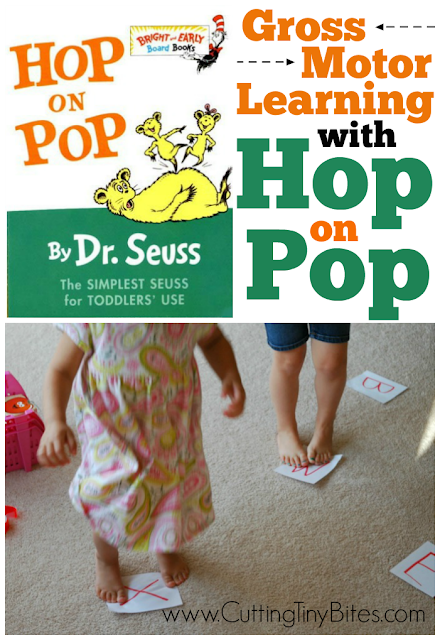 This simple game was a part of our Dr. Seuss Theme Preschool Week, along with Counting And Stacking With Ten Apples Up On Top and Sun Print Shape Matching that we paired with the Dr. Seuss book The Shape Of Me And Other Stuff. This fun gross motor activity goes well with one of our favorite books, Hop On Pop. 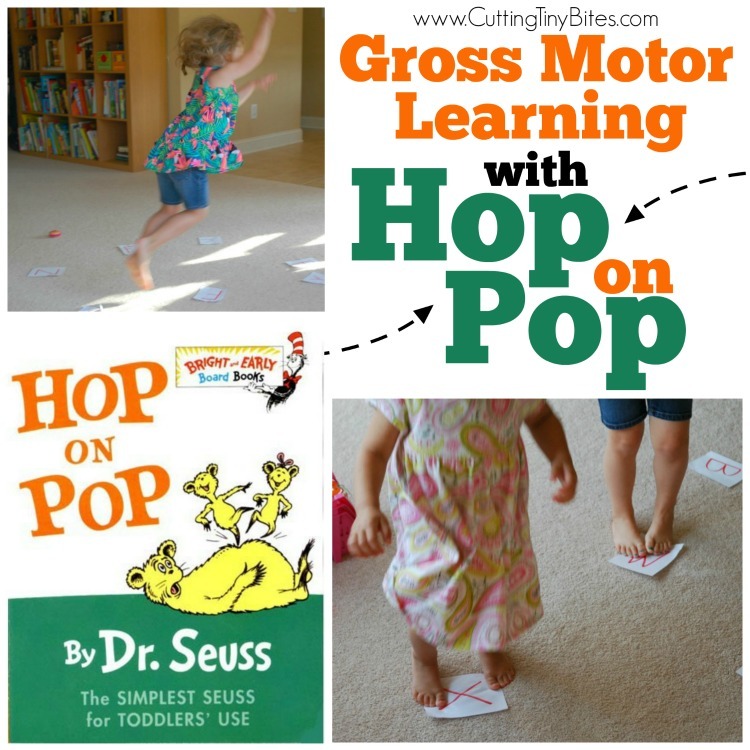 Best of all, you can easily adapt this activity for anything that your child may be learning. 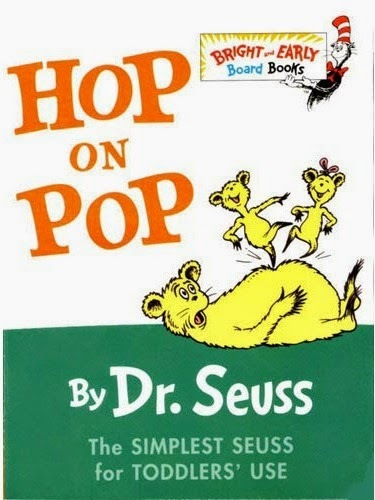 First I read the book Hop on Pop to the girls. They've heard it 100 times. Lena got upset when I ran my finger under the words that I was reading. I did it anyway. When we finished, I told them that we were going to HOP ON......other things! Take a set of alphabet flashcards, or just make your own. I scrawled these out while my girls ate breakfast one morning. 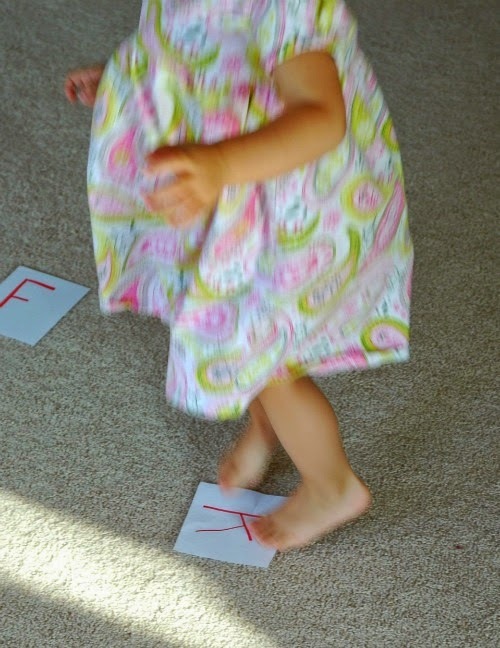 Spread them around on the floor, then call out certain letters for your little ones to HOP all over! "Hop on J," "Hop on Q," and so on. Then we did the whole alphabet in order as we sang the ABC song. After we worked on letters with Maggie, I switched out the cards and used a set of sight word flashcards that Lena uses sometimes. The great thing about this activity is that you can customize it for whatever your kids are learning at the moment. Toddlers could work on shapes and colors. 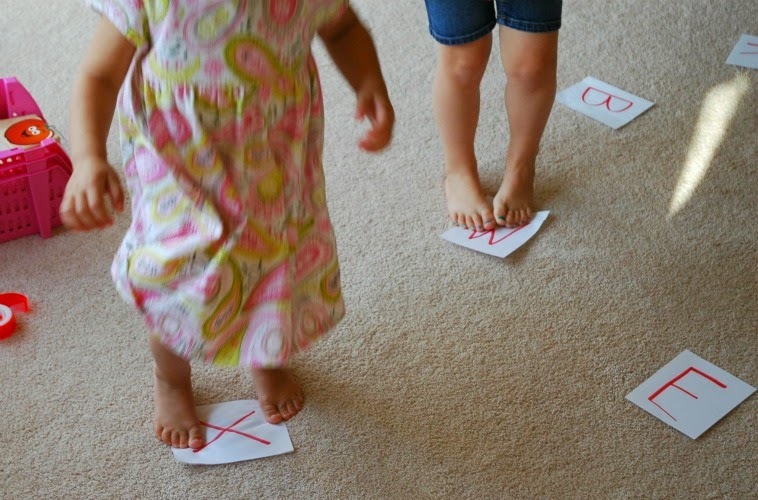 Preschoolers might play this game with letters or numbers. 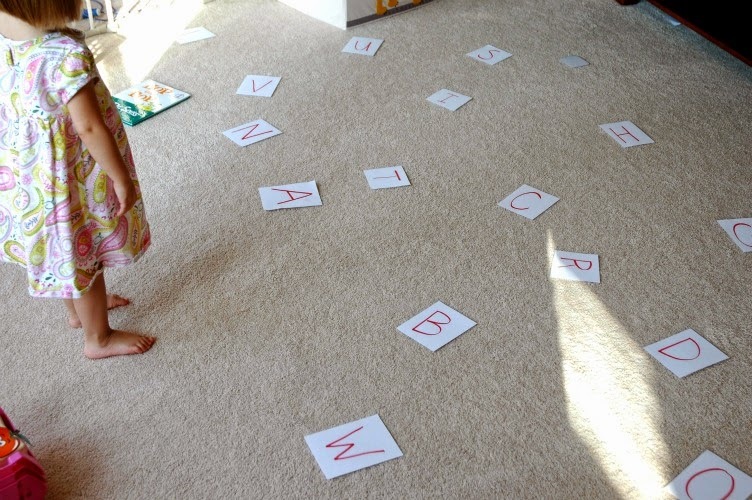 Kindergarteners could play with sight words. Early elementary kids could even join in the fun with basic math facts! Whee! This activity kept my girls engaged, active, and learning for a solid 20 minutes (which is a long time in preschool land). They were worn out and ready for their nap when we finished! 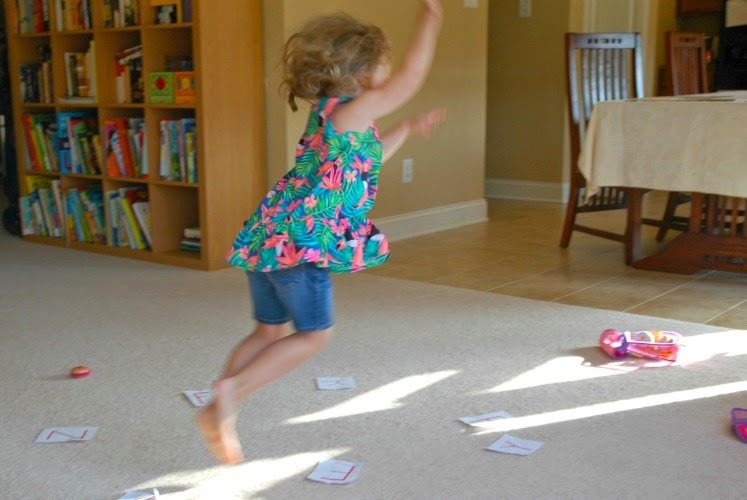 Active game for kids that can be adapted for whatever your toddler or preschooler is learning-- numbers, letters, sight words, colors, or shapes. Also great for a Dr. Seuss theme unit.